Forget scrapping in the shopping aisles for those Christmas presents, we've had our own afternoon of high drama at Anfield. Liverpool nicked a point to move up to ninth, above their city rivals Everton, while Albion stay 13th. Time for me to say goodbye but if you, like me, can't wait to hear what Pulis and Klopp have got to say after that humdinger then head over here for all the post-match reaction. What you waiting for?! Get over there now. Divock Origi looks proud as punch. Not surprising seeing as he's just bagged his first Premier League goal. "I just kept on working and I'm happy to score," says the Belgian in the Anfield tunnel. "The coach said I had to do everything to bring something to team, I tried to go beyond defenders and shoot and I managed to get the goal. "It was a difficult game because West Brom are a physical side. But we showed mental strength and got a point." The Anfield Kop shows its appreciation to their heroes for continuing to push for the equaliser which, on the balance of play, they comfortably deserved. Reds boss Jurgen Klopp responds by ordering his players into a line to hold hands and salute the end behind the goal. They're celebrating like they've won the FA Cup! Annnnnd breathe! All over at Anfield. What a game, what drama. Liverpool couldn't force a dramatic winner, Albion hang on for a point. Equaliser!!! Anfield erupts as Divock Origi's speculative 25-yard shot is deflected off a Baggies defender and past a stranded Boaz Myhill. Gareth McAuley is the unlucky Albion man, while we must give credit to Origi for refusing to stay down when he was fouled before getting up to shoot. That Tony Pulis is a wily old fox. The Baggies boss eats up some seconds by bringing Rickie Lambert on against his former club. Salomon Rondon - after an energy-sapping shift up front on his lonesome - is given a well-deserved break. Liverpool are all huff and all puff. But they can't blow the West Brom house down. Right...here's the moment of truth. All eyes on the fourth official as he reveals how many minutes of stoppage time. There will be EIGHT additional minutes (after Dejan Lovren's injury) for Liverpool to nick at least a point. Another minute, another Liverpool effort. Substitute Jordon Ibe wriggles into space on the edge of the Baggies box, firing wide of the right-hand post. Last throw of the dice for Liverpool. Brazil attacker Roberto Firmino enters the action, Adam Lallana's goose is cooked. All Liverpool now. As it has been for most of the match to be fair. Don't expect much Albion attacking. What a chance. Adam Lallana finds himself clean through from Christian Benteke's pass, steadies himself and tries to bend into the corner from a tight angle. But Boaz Myhill rushes out of the Albion goal to block with his legs. Generous applause for Dejan Lovren as he is taken off on a stretcher, Craig Gardner going over to apologise. No booking for the Baggies midfielder - much to the disgust of the home fans. Divock Origi comes on for Lovren as the Reds go for broke. Blood is pouring out Dejan Lovren's knee. The game is paused for a couple of minutes as the Liverpool defender is treated by several medics. Oh no. This does not look good for Liverpool defender Dejan Lovren. The Croatian competes for a 50-50 with Craig Gardner - and comes off second best. Gardner takes the ball but also catches Lovren's knee with his studs on the follow through. Easy peasy. Jonas Olsson (3) was allowed too much space to meet Chris Brunt's corner and the Baggies are ahead. Liverpool! You were warned before the game about Albion's height and aerial threat by Jurgen Klopp. But it has not been heeded. This time West Brom are not denied a second goal! And again it is Jonas Olsson. The long-haired Swede's height has been a constant menace to the Reds backline and he is allowed to climb highest to nod in Chris Brunt's corner. Poor old Simon Mignolet. He's having a tough day at the office. Groans go up from the home fans as the Belgian opts to punch clear James McClean's left-wing cross rather than catch it. Bit harsh are those jeers I'd say. Good spell of football from Albion. The Baggies string together 15 or so passes, but once the ball goes up to Salomon Rondon, he has little support and the move breaks down. Happy with what you've got Baggies fans? Or time for a change to something more adventurous? Your team are still under the cosh, but coping reasonably well. Panic over. Gareth McAuley gingerly limps to the touchline, has a dose of the magic sponge, then races back on to the pitch. West Brom back to their full complement. Gareth McAuley might as well have just made a 'T' gesture with his hands to the referee. He needs a time out. Not sure exactly what has happened to the Baggies defender, but he looks like he is in pain. Tony Pulis is also wearing a painful expression - he doesn't want to bring the big centre-half off. These Liverpool chances are arriving quicker than Transpennine Express trains at Lime Street station. Christian Benteke is latest culprit, scooping a half volley wide under pressure from the Baggies defence. Shot number 16 of the afternoon for Liverpool. Again, Albion keeper Boaz Myhill squints into the sky to watch the ball whizz over his head. Jordan Henderson curses himself for missing the target. Alex McDonald: Liverpool should have kept Pepe Reina he was a much better keeper. Mark, Wigan: Let's not get carried away about Mignolet. David de Gea threw it in his own net yesterday and he's considered a worldy! Ben, Southampton: Forget Liverpool for a sec, I'm sure West brom have come back from 1-0 in at least their three previous games? West Brom have - as Jurgen Klopp correctly predicted - caused heaps of bother for Liverpool at set pieces. Now it is the turn of Liverpool's big men to wreak some havoc. Dejan Lovren climbs highest to reach James Milner's cross - from an almost identical position to Albion's first-half injury-time 'goal' - but can't keep his header down. As Alex Shillingford rightly points out below, West Brom are pretty toothless up front. And, as our graphic shows, the reason is that Salomon Rondon (number 33) is as isolated as a remote Pacific island. Thankfully for those Liverpool fans of a nervous disposition, the ball is deep in West Brom water. A right-wing cross is a touch high for Christian Benteke, before James Milner drags a shot from outside the area wide. A few groans from the home fans as Liverpool keeper Simon Mignolet - who made a ricket for the Baggies goal remember - dallies with a backpass. As MOTD commentator Alistair Mann rightly points out, there's a sense of unease around Anfield when the ball goes back to the Belgian. I've not had the pleasure of seeing Tony Pulis's face since the restart. But I wish I had. I'd imagine the expression 'bulldog chewing a wasp' would apply. Even start to the second half. Team talks done, water taken on board. Time to roll again. Liverpool restart the action. Things have livened up at White Hart Lane...a little bit. Spurs know they can go fourth with a win and, thanks to Eric Dier's header, they're looking good value for that. Follow that game here. Ian, Liverpool: This why Liverpool need a more confident goal keeper - Simon Mignolet is doing exactly what he did this time last year - he needs to be dropped for Bogdan - at least he is more commanding of his penalty area. Going into the break behind would have been harsh on Liverpool. Not only was Albion's 'goal' offside, the Reds have hogged possession, dominated territory and battered the visitors in terms of shots. Liverpool 13 West Brom 2 in the attempts-on-goal column. West Brom players surround the officials as they leave the Anfield pitch for half-time. That drama has certainly provided a buzz around the stadium. Replays suggest that the linesman made the right call...eventually...but West Brom's anger will stem from the fact he appeared to have his mind changed by referee Craig Pawson. Pawson can't have had a better view than his assistant - surely?! Alex, Loughborough: Getting fed up of reading 'Mignolet error' this season. Mark, Kingswear: We have to make Jack Butland a priority. Just give Stoke what they want for him and get him in quick. You can't have a keeper like Mignolet, you just can't. Philippe Coutinho and Christian Benteke are having a personal battle to see who can crash the most shots at goal in this match - they have had four each. The Brazilian tries his luck again from outside the box (the green arrow furthest right) but Baggies keeper Boaz Myhill comfortably gathers. As I told you a few moments ago, West Brom's goal was a right old mess (from a Liverpool point of view particularly). And here's the proof in graphical form. That cluster of numbers in the goal replay show that almost everyone on the pitch tried to have a swing at the ball before Craig Dawson (you can just see his number 25 peeking out) blasted in. All gone a bit quiet at Anfield. Philippe Coutinho shoots low from a central position, before Liverpool team-mate Christian Benteke swivels to fire wide. Some Reds fans scurry downstairs for a balti pie and warm cuppa. While we've been fortunate to enjoy two goals here at Anfield, they've not been so fortunate at White Hart Lane. Still goalless between Tottenham and Newcastle. And I'm reliably informed that the most exciting action is the referee falling over. If you want to stick your nose in to that game then head here. Oh no. Liverpool keeper Simon Mignolet won't be watching Match of the Day 2 tonight - he's had a 'mare'. The Belgian goes walkabout at the West Brom corner, fails to punch clear, allowing Baggies defender Craig Dawson to smash in. Scruffy but effective for the West Brom. Game on! Liverpool are trying to press home this advantage know. Philippe Coutinho, who has provided that spark that Liverpool often miss when he's not playing, fires straight at Boaz Myhill. Easy stuff. West Brom's marking might have been slacker than your work-shy colleague, but let's not do Liverpool a disservice here. The Reds strung together 17 passes before Henderson finished off the move. 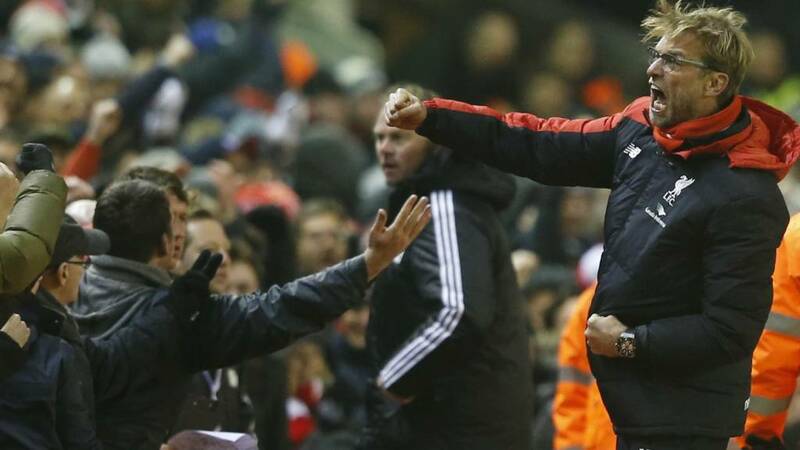 West Brom manager Tony Pulis turned away in disgust after that Liverpool goal. Disgust at how easily Henderson was able to stroll into the danger area. Someone is going to get a rollicking at half-time. Ironically the goal came just after the Baggies best spell. Guess who's back! Liverpool skipper Jordan Henderson marks his first Premier League start since August with a goal. Henderson ghosts into the Baggies box with a late run, sweeping in Adam Lallana's cushioned header. There have not been many positives for Tony Pulis to shout about - until now. Craig Gardner races on to Darren Fletcher's cheeky backheel to whip in a cross that deflects off a Liverpool shirt. Luckily Simon Mignolet is alert enough to stop the ball creeping in. Another half-chance for Liverpool. Spanish speedster Alberto Moreno flies down the left flank, whipping in a ball towards Christian Benteke. The big man climbs highest but even his lanky frame is not tall enough to direct the header goalwards. Liverpool have flown out of the traps. Christian Benteke has his pocket picked by Craig Gardner, before West Brom are forced on to the back foot again. This time Jonas Olsson's header only goes as far as Philippe Coutinho, who smashes over the bar from 18 yards. The Brazilian grimaces. He knows he should have hit the target. Nathaniel Clyne is steaming up and down that right flank like a Victorian locomotive engine. The Liverpool full-back's eyes light up as a loose ball breaks to him about 25 yards and, urged to 'shooooot' by the home fans, does exactly that. He scuffs his effort, forcing Jonas Olsson to hack out for a corner. And they haven't added to that inside the opening eight minutes. Nathaniel Clyne tricks his way past the tracking James McClean, then again for good measure, but can't pick out a red shirt. Earlier we speculated about where exactly West Brom would be deploying their personnel. It appears Jonny Evans is playing in a holding role, with Chris Brunt at left-back. The Northern Irishman - Brunt not Evans - is given an early wake-up call, needing to track the run forward of Liverpool right-back Nathaniel Clyne. The opening has been quieter than a hungry door mouse nuzzling on a tasty block of cheese. Both teams battling for early supremacy. No early dominance. Game on! Liverpool get the match under way. Reds boss Jurgen Klopp, by the way, has handily left his baseball cap at home. Just so we can differentiate between him and Tony Pulis as they prowl the touchline. Liverpool: Mignolet, Clyne, Skrtel, Lovren, Moreno, Henderson, Can, Milner, Lallana, Benteke, Coutinho. Subs: Toure, Firmino, Lucas, Allen, Origi, Ibe, Bogdan. West Brom: Myhill, Dawson, McAuley, Olsson, Brunt, Evans, Gardner, Fletcher, Morrison, McClean, Rondon. Subs: Chester, Anichebe, Lambert, Berahino, McManaman, Lindegaard, Gnabry. West Brom are well-known for their physical stature - and Liverpool boss Jurgen Klopp knows his team will have to us their heads (literally) this afternoon. "They are a physically strong team, a lot of tall players, they like set plays, they like fighting for second balls," says the German. "They don't too much build-up play, so it's intensive. They defend pretty deep, pretty hard." "What you want to do to Lambert is stick your right hand under his armpit, then wrap your left arm around his waist. He won't get near the ball." Steven Gerrard, who is back training with the Reds during the MLS close season, tells Jurgen Klopp how to deal with Rickie Lambert. Possibly. Anfield is almost full with hooded, thermalled and scarfed Reds and Baggies fans. Both teams are limbering up in the tunnel - as are the players at White Hart Lane. If Tottenham v Newcastle is more your cup of tea then you can follow Alistair Magowan's wise words here. But if you do wander off then make sure you come back here. Please. Yes Liverpool! This is more like it. The fella in charge of the CD player has plumped for hometown hero Paul McCartney next on his Christmas playlist. A couple of German-looking blokes wearing Borussia Dortmund shirts bop along in the Kop. And with West Brom, Watford, Leicester and Sunderland awaiting over the festive period, Reds fans will be hopeful of having a simply wonderful Christmas time. The spoils to be shared? "I think Tony Pulis has done an excellent job at West Brom. You know what he’s about. The danger is people get bored with West Brom being 13th. "There will be no issues of them staying in the league under Pulis. If he had Saido Berahino at the top of his game, where would they be? I think this game will be a draw." "Prior to last week's unexpected defeat at Newcastle a number of experts had begun tipping Liverpool as an outside candidate for the title. "While one bad day at the office doesn't mean the momentum has been lost, it does mean that victory over West Brom this weekend is significant in order to maintain it. "That said, Tony Pulis has typically constructed a solidity within his side, particularly away from home, which suggests the hosts will have to work hard for the points." I think Jurgen Klopp agrees. The German doesn't look very happy as he surveys the scene from the Anfield centre circle. It's definitely the music which he is grimacing at, not the pouring rain. I've got a confession to make. I'm not exactly sure whether West Brom will line up with Jonny Evans in a holding role as our graphic below indicates. West Brom's team news tweet appears to suggest he will start at left-back, but Evans did sit in front of the back four in last weekend's 1-1 draw against Tottenham. We will find out soon enough. Not much for Tony Pulis to ponder this week. The West Brom boss has been forced into one change with Stephane Sessegnon ruled out with a hamstring injury. The Benin midfielder is replaced by Craig Gardner. Former Liverpool striker Rickie Lambert has to settle for a place next to Pulis in the dugout. Argentine midfielder Claudio Yacob was due to return after serving a one-game ban, but has been ruled out with personal issues. The big guns are back for Liverpool. Reds boss Jurgen Klopp restores Philippe Coutinho, Christian Benteke, Martin Skrtel and Alberto Moreno to his starting XI following Thursday's 0-0 draw at Sion in the Europa League. Skipper Jordan Henderson makse his first Premier League start since 17 August. Hello! Little separates Jurgen Klopp and Tony Pulis in sartorial style (especially to those, like me, who have to squint at the telly), and little separates them in the Premier League table. Klopp's Liverpool are 10th after the positivity created under the German crashed to a halt - temporarily at least - with last Sunday's defeat at Newcastle. Pulis' West Brom are three places, and four points, behind the Reds. Will the Baggies be 'boing boing-ing' within touching distance of their opponents after today's clash? Baseball cap? Check. Glasses? Yep. Tracksuit? Sure. Outstretched-arms gesture? It's there. Welcome to our live page for Liverpool v West Brom. We’ll have live text coverage here from 16:00 GMT. You can keep up to date with all of today's other matches including Tottenham v Newcastle and Aston Villa v Arsenal.